Throughout the civil rights movement, African American advocacy groups worked toward securing and protecting the right to vote, especially in the “Jim Crow” South. Progress in the 1950s was slow. The push for voting rights encountered a policy of delay, repression, and reprisals used by white southerners after the Brown v. Board of Education Supreme Court decision made it clear that the federal government would pursue desegregation. By 1956, after the murders of two Mississippi voting rights advocates, it was also clear that the federal government had to stand behind the efforts of civil rights advocates in order for Black voter registration to move forward. With encouragement from President Dwight Eisenhower, Senate majority leader Lyndon B. Johnson, and Vice President Richard Nixon, Congress enacted the first civil rights legislation in over 80 years, the Civil Rights Act of 1957. The Civil Rights Act of 1957 and the Civil Rights Act of 1960 were criticized by African American activists. The Acts strengthened the ability of the Justice Department and federal judges to respond to violations of existing voting rights laws, but progress was slow because violations had to be fought in court on a case-by-case basis. One success of the Acts was the creation of the Commission on Civil Rights (CCR). This bipartisan commission pursued complaints, held hearings, and conducted field investigations that confirmed and publicized the two main issues facing Black voters in the South: the refusal of white southern authorities to permit African Americans to register to vote and the intimidation and reprisals faced by those who tried to register anyway. Voter Registration and the "Freedom Summer"
Another success in the early 1960s was the passage of the 24th Amendment by Congress in 1962. This amendment banning poll taxes as a requirement for voting in federal elections was ratified in 1964. Intensive, organized voter registration activities in the South started in 1961, with efforts led by the Student Nonviolent Coordinating Committee (SNCC) and the Council of Federated Organizations (COFO). Their work had two goals: register voters and build local Black community organizations that could fight for political change in the South. After the Freedom Rides of 1961, local and national Black leaders began a drive to register African Americas in Mississippi – a state chosen because it had the lowest percentage of eligible Black voters registered in the country (6.7%) and some of the greatest barriers to African American voting in the nation. The project, known as “Freedom Summer,” recruited over 1,000 out-of-state volunteers to work with thousands of African American Mississippians to register voters over the summer of 1964. They were met with violence from police, white supremacy organizations, and private citizens. Over the 10-week summer project, more than a thousand people were arrested. Black churches were bombed and at least 80 “Freedom Summer” workers were beaten. The summer's most infamous event was the murder of three young civil rights workers, a Black CORE volunteer and his two white co-workers. On June 21, James Chaney, Andrew Goodman, and Michael Schwerner set out to investigate a church bombing near Philadelphia, Mississippi. They were arrested that afternoon for alleged traffic violations. After their release, they were met by a Ku Klux Klan ambush and were kidnapped and murdered. A massive, well-publicized FBI investigation ("Mississippi Burning”) led to the discovery of their bodies under a nearby dam six weeks later. The murders made headlines across the nation, and public outrage over the killings created an outpouring of national support for the civil and voting rights of African Americans. The Selma to Montgomery March and "Bloody Sunday"
The Selma to Montgomery March marked the height of the battle for African American enfranchisement. The march was actually three marches that took place in March 1965. On March 7, about 600 voting rights activists started a march from Selma, Alabama, to Alabama’s capital, Montgomery. They were led by John Lewis of the Student Nonviolent Coordinating Committee (SNCC) and Hosea Williams of the Southern Christian Leadership Conference (SCLC). At the time, less than 1% of eligible Black citizens were registered to vote in Dallas County, Alabama, where Selma was located. At Selma’s Edmund Pettus Bridge, the marchers were brutally attacked by Alabama state troopers wearing gas masks, along with local police and a posse on horseback. The day became known as “Bloody Sunday” because of the unprovoked, extreme police violence against peaceful marchers. Television footage of the attack shocked the nation. People from all over the country traveled to Selma to support the cause and finish the march to Montgomery that was disrupted on Bloody Sunday. 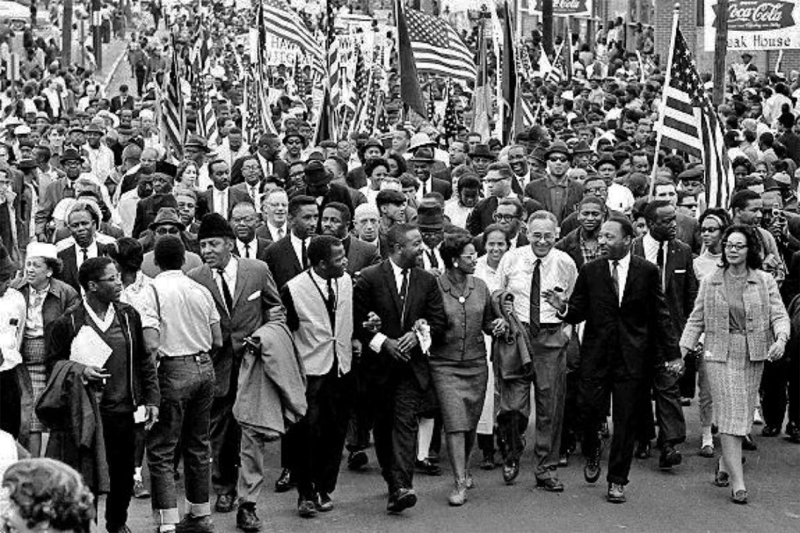 On March 9, Dr. King led another march from Selma (“Turn Around Tuesday”) that turned back because of a federal court order. The third march succeeded in completing the five-day journey to Montgomery, on March 22. Worldwide publicity of the Selma marches finally pushed Congress to pass legislation that would guarantee voting rights for all Americans. President Lyndon B. Johnson signed the Voting Rights Act into law on August 6, 1965.